ArmRx® Arm and Leg Gloves are made from environmentally friendly recyclable polyethylene. They are easy to store and do not require special disposal. They are light, neatly packaged and convenient for use any time and anywhere - in the hospital, at home or during travel. Self dispensing counter top or shelf box contains 20 Individual Leg Glove packages. Each Individual Leg Glove package contains one ArmRx® Leg Glove, 2 ArmRx® hook and loop straps and complete instructions for installation and use. 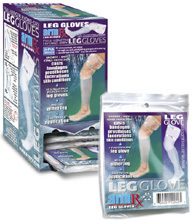 Each single pack of ArmRx® Leg Gloves consist of a single legging sleeve with 2 "hook and loop" straps that adjust the glove to the required size and fasten it securely on the limb, forming a watertight pocket that helps keep the user's leg completely dry even during total submersion in water. Contains: 4 ArmRx® Leg Gloves, 2 ArmRx® hook and loop straps and complete installation and use instructions. ArmRx® Leg Gloves Multi-Pack of 4: The leg gloves are disposable, however, this does not translate that they must be discarded after a single use. The gloves are made from a strong clear polyethylene and can withstand more than one bath or one shower, if appropriately cleaned, dried and stored between re-uses.